Annual sales of devices running Google's Android platform had already surpassed Windows PCs long ago --?in March of 2012. But but but...Apple should have reached that mark last year. Sell! Seriously, I wonder which made more revenue and profit. That would be an interesting number! As the prices of each year's Macs goes down, and Apple continues giving great reasons for switching, and MS continues to make people hate everything Windows (not all, naturally), MS will continue down. I really hope Nadella can undo Gates/Ballmer and make a great company out of MS. I want to be tempted, regardless of whether it would be successful. I'm also hoping new OS choices come out of Japan, China, India, South America and Europe. The way Apple is integrating soft/hardware, it would make sense for a selection of companies to pool resources and create an integrated user experience, like Apple. MS will need more than itself. The biggest question for Microsoft is how did they miss the mobile boat totally? 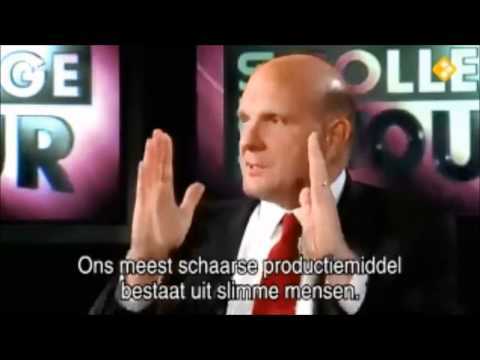 From Ballmer laughing at the iPhone to the embarrassing market share of Windows Phone. I mean they didn’t even see it coming. Ha, I remember making this prediction about 6 years ago. People thought I was nuts. They saw it coming. They tried to succeed in mobile, but they ended up like a deer in the headlights. I can't believe over 300,000,000 Windows computers are being sold. Who are buying these things? My wife is due for a new computer at work. She has mostly been using her personal MacBook Pro because the Dell crap on her desk is a hunk of junk. Some people in the building have Macs so she asked her boss if she could get an iMac. Boss said "Sure--whatever works best for you." My guess would be people who can't afford the entry price of an Apple machine. There are also the gamers, though they probably build their own if it's not a laptop. Yes, there's this place called the enterprise,( noun /?ent? (r)?pra?z/) many of them still have Windows only applications. Things like VisualStudio, Access, etc. As well as people who game, or people who develop for Windows...please, take off the blinders. You realize that no sane person expected the PC to just die off. So much for windows everywhere it's OS X/ios, which are essentially the same, everywhere. Corporates. They're still Windows centric. They just took way to long to respond. And then even after that, people who did adopt Windows Phone got screwed when they couldn't upgrade from Windows Phone 7 to 8. Apple iPhone business is larger than all of Microsoft's businesses put together. Also, if you remove the iPhone, Apple's remaining business are STILL larger than all of Microsoft's business put together. Denial helps. Pretending you're still the old dominant Microsoft helps. Tell yourself everything will be just fine helps. Does the Windows PCs sold number include people running Boot Camp? You may not think it's a lot, but I have experience in a few colleges where there are thousands of dual boots - and that's just me. I would love to see a breakdown of Windows Home vs. Pro vs. Enterprise licenses. Right about the same time that I would like to see Androids on par with the 5c vs. Somewhat-Smart-Phone vs. Android Other devices which includes Feature-Plus-Throwaway-Phones. The truth would be far too upsetting to the industry I'm sure. I'm not going to replace an ipod touch or ipad with a Windows PC/Laptop or vice versa. They are completely different things. One is cheap-ish consumer device, the other is either a home or business computer. This stat is pretty pointless. As to the larger suggestion that this means Apple is replacing PCs, that is definitely the case for some people but I know for myself that when I'm doing serious business work on my MacBook pro, I'm more often than not doing on Windows 8/Windows 10 VMs on Fusion. For pure productivity I hate to say it, but you can be more productive on a Windows box IMHO. I'm probably going back to PC on my next laptop refresh.